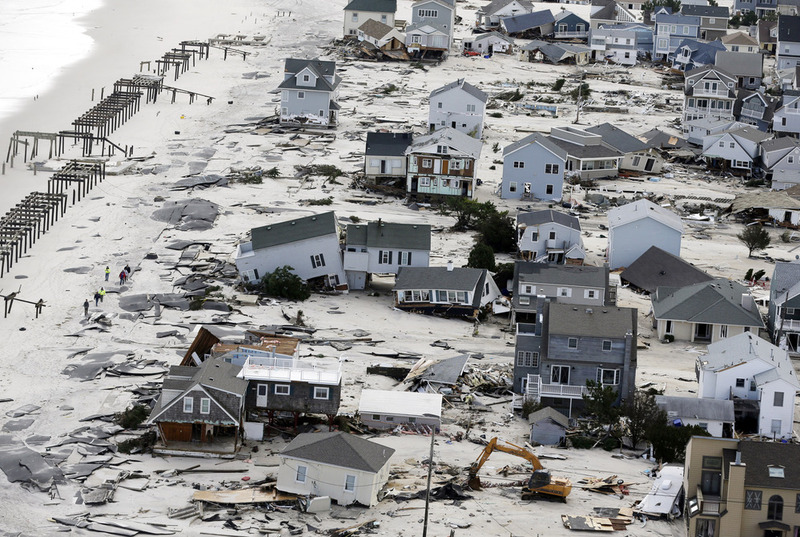 This aerial photo shows destruction in the wake of Superstorm Sandy on Wednesday in Seaside Heights, N.J.
Superstorm Sandy capped what's been a pretty impressive couple of years for U.S. natural disasters. There have been wildfires, tornadoes, floods and derechos. And insurance companies are on the hook to pay billions in related claims. "We're seeing more of everything, and what we're doing is trying to factor that in going forward as we work with others to have a better sense of what the future holds," says State Farm spokesman David Beigie. Here is one thing the industry agrees is true: The cost from hurricane damages is increasing. That's largely because population density and the cost of coastal property increases every year. Do insurers expect to see more frequent and more intense weather events in coming years? Opinions diverge. Peter Hoppe heads the Geo Risks Research center for Munich Re, a global company that insures other insurers. His company put out a report just before Sandy warning that North America will face a rising number of natural catastrophes due in part to greenhouse gas emissions. "We believe that climate change is a big problem and will drive losses in the future," Hoppe says. He says there is no evidence climate change caused Hurricane Sandy. But, he says, it doesn't matter whether insurers believe in man-made climate change. His report says the number of weather-related events nearly quintupled in North America over the past three decades. And that means premiums will increase in the long run if exposure continues to increase. "On the long term, definitely we have an interest in what will be happening in 50 years, or even in 100 years because this concerns our business model in general. It may be that in the long term, things become uninsurable," Hoppe says. But this is not a view embraced by the whole industry. "Are we really seeing more storms, or are we just recording more storms? That's the big question," says longtime expert Karen Clark, who runs her own risk-management consultancy. Clark says the problem is that hurricane prediction is a very young science. She notes that records documenting hurricanes go back only about a century, a data set far too small to draw big conclusions. She says after Hurricane Katrina â" the most expensive of all documented storms â" some predicted a warming cycle would produce more powerful storms. That forecast did not bear out. "It just shows you that we just are not that smart, you know, when it comes to what's really going on," Clark says. Bill Keogh, president of Eqecat, one of the major risk-modeling firms in the U.S., says that despite what it may seem, we are now in a statistically low period of hurricane activity. After Katrina, few powerful hurricanes have made landfall in the U.S.
That is not to say Sandy won't change the way insurance companies assess their weather risks. "Risk models change all the time, and they change when we have new information," Keogh says. That's especially true when that information is unusual. And Sandy was unusual because it hit the Northeast, as few hurricanes do, and because it veered inland, instead of toward the ocean. That information from Sandy, Keogh says, will shape views about the probability of future risks. But probability is not the same as a crystal-ball prediction. "Everybody wants to know: 'Tell me the answer. You know, over the next five years, how many hurricanes will we have, what will they look like, how will much they cost. And when will the occur?' We don't do that," Keogh says. The only thing we can do, insurers say, is build our buildings safer, and better prepare for what will eventually come.